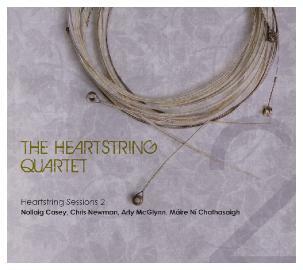 Heartstring Sessions 2 - New! The new quartet CD was recorded in two weeks at the end of January and Chris took a further week to mix it. It was then mastered and sent off for manufacture, and the CDs were delivered to the quartet in time for the first concert of their Australian tour on Sat 20th in Albany, WA (part of the Perth International Festival). The CD is an effervescent cocktail of gorgeous songs, traditional Irish music, swing jazz, bluegrass and the quartet's own compositions, culminating in "Flying off the Handel", a celebratory re-working of a Handel sonata in their unique style! The CD won't be released in Europe or the US for another few months, but pre-release copies are now available to buy exclusively from our Old Bridge Music website!!! This classic song was composed for the 1931 Marx Brothers film Monkey Business. It quickly took on a life of its own and became a swing standard, being particularly associated with the Boswell Sisters. Nollaig sings it from the female point of view in her own distinctive style - and everybody gets a chance to do some solos! Two jigs composed by John Dwyer, a native of the beautiful Beara peninsula in West Cork and a second cousin of Máire and Nollaig's. Nollaig composed this tune in memory of poet John O'Leary, a close family friend who lived for many years in Alliihies, Beara, Co Cork (the birthplace of Nollaig and Máire's mother Úna) and died there in a tragic sailing accident in 2012. His relationship with the sea is explored in his collections of poetry, Salt and Sea. In "To Do List", poem XXVII in the latter collection, he details ambitions both high-minded (the eerily prescient "Write name in water") and amusingly mundane ("return Teach Yourself Waltzing Tape"). Some years ago Nollaig and other members of the family attended an enormous party in the barn at John's farm in the townland of Bearnas - still remembered in the neighbourhood. Thus "The Bearnas Barn Waltz", a light-hearted tune in celebration of a great man. The great Nashville session fiddler Tommy Jackson (1926 - 1979), who in his 1950s heyday invented what we now think of as the standard country fiddle back-up style, is credited with re-working the old-time tune "Lonesome Indian" into "Cherokee Shuffle" and adding the second part. There are now a number of versions in circulation. Attributed to William Connellan by the collector Edward Bunting in his 1840 collection. Appears in John and William Neal’s Collection of the Most Celebrated Irish Tunes, published in Dublin in 1724, as Molly Halfpenny. The brothers Thomas (b. 1640) and William Connellan from Co Sligo were notable harpers and composers. (Halfpenny is one of many anglicisations of the Irish surname Ó hAilpín / Ó hAilpéne – others include Halpin, Halpenny, Hapenny, Hapeny. That branch of the family that originated in Co Monaghan used the anglicised forms Halpeny or Halfpenny from the mid-sixteenth century onwards; persons of that name are listed as being resident in Monaghan and Meath in a number of historical records. So at least we know where the Molly Halfpenny honoured by this composition is likely to have been born, though we may know nothing else about her! Several versions of this traditional song have been collected in Ireland, the UK and in the USA. Three of the quartet's favourite reels. Chris wrote this tune in celebration of the long light-filled days of mid-summer. This beautiful song tells the story of the Co. Tipperary Jacobite aristocrat Éamonn Ó Riain (1670 - 1724), whose ancestral lands, like those of the majority of his peers, had been confiscated after the Cromwellian Wars and who, after the Jacobite defeat of 1691 continued their struggle in the form of guerilla warfare. Now outlawed, they were known to the English authorities as "tories" or "rapparees". Éamonn's laments that the wealthy life of a country gentleman to which he had been born is now but a distant memory, that he is forced to endure the privations of a life on the run and that the only future he can envisage for himself is emigration - probably to France or Spain, the two favoured destinations for defeated Jacobites. The Humours of Kiltyclogher is one of Arty's favourite slip jigs. The quartet learned Joe Kilmurray's Jig from the wonderful playing of the unique accordeon / uilleann pipes duo, Peter Carberry and Pádraig McGovern. Chris wrote this tune when on a long road-trip from Kansas City to Austin, Texas, in the summer of 2014. A celebratory re-working of the Allegro from Violin Sonata in F Major by G. F. Handel in the quartet's unique style!